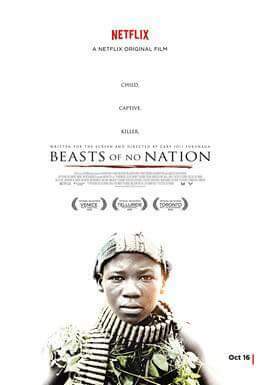 Beasts of No Nation – Add to your list! There has been a lot of talk about Netflix recently, especially since they are producing theatrical films, that are premiering both on Netflix’s and in theaters. The theater companies and studio heads are complaining because they could lose a lot of money. Especially if the films are very good. The first film to fall in this category is Beasts of No Nation. The film is about a child that lives in a war torn country. He looses his dad and becomes a child soldier. This is one powerful film with fantastic acting by Abraham Attah (in his first film) and Idris Elba. When I mean the acting is fantastic, I mean the academy should give them the Oscars now. Idris is so good in this film I wanted to join the fight even when I knew he was lying. Whoever says that he is always playing the same role or is not a good actor needs to watch this film. Even though Idris is the big star in the film, it’s Abraham’s film. We follow his character through hell and back. It’s a journey that works because its lead is believable. They aren’t acting; they became these characters and that’s a big difference. The film looks great too. It’s directed by Cary Joji Fukunaga who also directed the hit series True Detective. It deals with such a dark and disturbing subject matter. But Gary makes it look beautiful and bright. There is one scene that had Abraham walking through some mud in a trench. Sounds dirty but looks fantastic on film. I will say it again, it is a great film, with a strong cast, director and a powerful story. A must watch. 4 out of 4 hats.